Michael Feiz, M.D., F.A.C.S. is widely regarded as possibly the finest practitioner of bariatric medicine in the United States. Since opening his Beverly Hills, California practice, he has pioneered improved weight loss surgeries and has performed countless successful gastric sleeves and other beneficial weight loss procedures. A world class surgeon, Dr. Feiz has received praise from countless grateful patients for their outstanding outcomes as well as for his compassionate bedside manner. 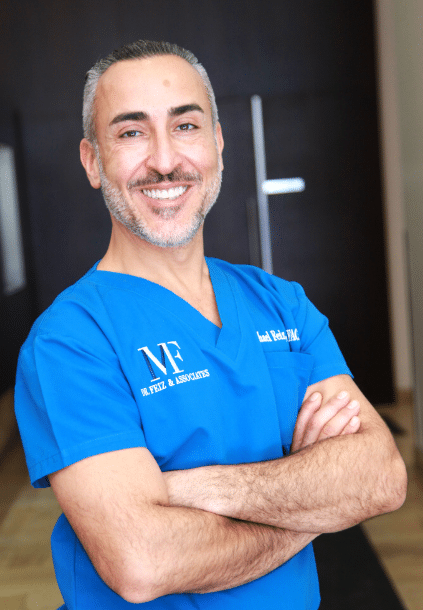 Dr. Feiz, whose practice boasts a zero mortality rate, understands the often touchy issues surrounding excess weight and weight loss; he is happy to discuss whatever concerns patients might have before and after their weight loss procedures. Before starting his current practice, Dr. Feiz completed his internship and residency in Surgery at the world famous Los Angeles County USC Medical Center. He performed his fellowship work at Cedars Sinai Medical Center, where he received specialized training in Bariatric and Minimally Invasive Surgery. He is an active Member of the American Society for Bariatric Surgeons, and the American College of Surgeons. A superb communicator in three languages, Dr. Feiz is fluent in Spanish and Farsi as well as English.